Recently, I got a hold of a little bit of scrap left over from some really nice quadrotor frames. The stuff is a laminated sheet of carbon fiber and stiff foam. A high tech sandwich if you will. I mentioned that I might try to make something similar in a previous post with balsa rather than foam, but having it turn up pre-made isn't a bad thing. So I drew up some rough plans, cadded them, and got straight to milling. I used the free 2D version of HSMxpress to get from .sldprt to G code. Since I got scraps of varying sizes, I designed the frame to be a number of smaller pieces, bolted together by 4-40 hex-head nylon cap screws. I didn't really have any other options to get the desired frame size, and I figured the screws might provide some level of crash protection if they choose to shear before the arms suffer any damage. 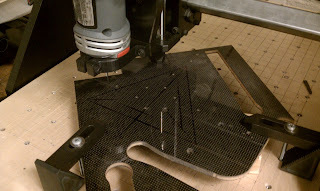 Here's a shot of the larger piece of scrap on the CNC router. This piece will become the center of the frame. I borrowed the multiwii setup back from the quadrotor, restoring it to its tri-rotored glory of yore. Motors: old Ascending Technologies motors. They're wound star wye and were made specifically for multirotors. I like them. Props: also AsTec. Still sold here. 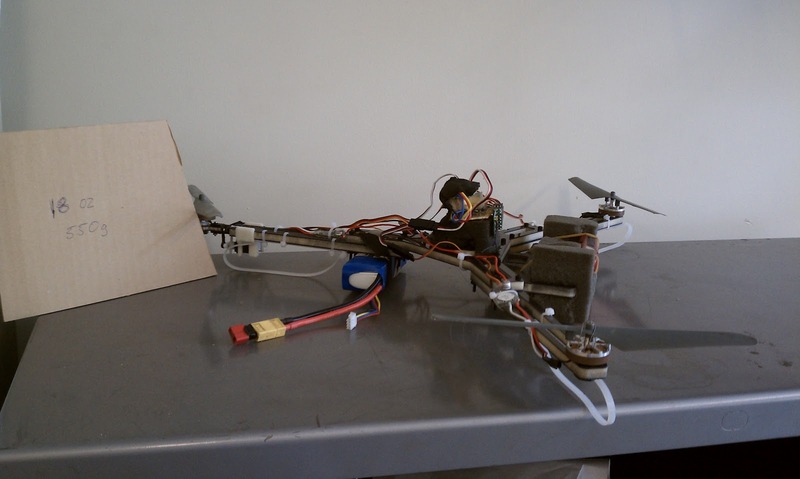 Also multirotor specific. Very nice props, virtually unbreakable as they are made of a very dense and pliable plastic. quiet, haven't had vibration issues yet.